This is the MULTIFANDOM GENFIC EXCHANGE. If you want to write/read some great gen fanfiction ("gen" means that the focus is somewhere other than romantic attachments, whether het or slash), then we have the fic exchange for you! (May 19-26), we are nominating fandoms to be OFFICIAL FANDOMS. (May 27 - June 3), we are voting for fandoms to be OFFICIAL FANDOMS. (June 4-25), we are holding sign-ups for the exchange! RIGHT NOW, we are almost to the end of our writing period! Stories will go public soon! Please, please, please take the banner and pimp out to your f-list and to any fandoms you're a part of! 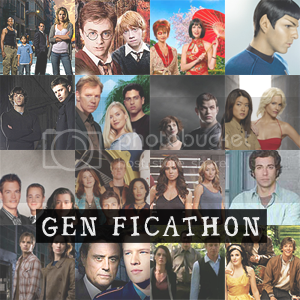 Be sure to join and watch gen_ficathon! Rules and procedures are based on/inspired by femme_fic.